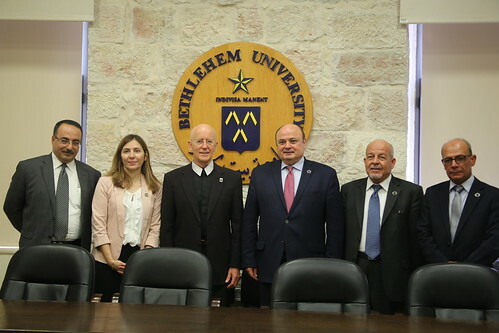 Bethlehem University and the Monetary Authority signed a Memorandum of Understanding (MoU) on Thursday, June 7, 2018 in the Executive Conference Room. The general purpose of this agreement is establishing a joint cooperation to serve the academic sector through joint activities including banking and finance awareness lectures. It also aims to organize practical training programs for students of the Shukri Ibrahim Dabdoub Faculty of Business. The signing was done in the presence of Brother Peter Bray, Vice Chancellor, Dr. Fadi Kattan, Dean of the Faculty of Business, Dr. Azzam Al-Shawa, the Governor of Palestine Monetary Authority, and a delegation from the Monetary Authority. The guests were welcomed in the Executive Meeting room for the signing, during which speeches and good natured jokes were exchanged. Brother Bray praised the role of the Monetary Authority in the development of the Palestinian banking sector and its social responsibility towards all groups of society, especially university students. Dr. Al-Shawa pointed out that the signing of the MoU comes within the framework of developing and strengthening the relationship between the Palestinian Monetary Authority and Palestinian universities.